He (or is it she? sorry...) was also particularly dismayed to find karaoke rendered in Welsh as carioci, despite the fact that word-final e is perfectly at home in Welsh (as in bore ‘morning’) though not in English. But the item that most concerned him/her was the name of the Basque country (Gwlad y Basg), Basque Euskadi, rendered as Ewscadi. Even as a reflection of the Spanish or Basque pronunciation this is not accurate: s/he feels it ought to have -addi, reflecting the Iberian -aði pronunciation. Christy wanted to know who was responsible. I suppose if anybody can make rulings on this sort of thing, it must be the Welsh Academy (Yr Academi Gymreig), with whose Dictionary (1995) you may be familiar. Although Christy deplores the fact, it is very clear that loans in modern Welsh regularly come via English (rather than direct from, say, Japanese or Spanish) and that they are then respelt in accordance with Welsh orthographic conventions. Modern Welsh spelling does not use the letters k, q, v, x or z. The spellings complained of are very normal in Welsh. In the Academy's Dictionary, under words spelt in English with ka-, you'll find Cabwci, cafftan, cacemono, Calahari, caleidosgop, Calefala, camicasi etc. On the other hand the same dictionary gives Kafkaésg and kalmia, so evidently personal and Linnaean names are treated differently. Under English Q- we find cwadrîl, cwaga, cwarts, cwasar, Cetshwa, cworum, cwoca. But Quaker is properly cymricized as Crynwr (crynu ‘tremble’). [e] at the end of a word in common in the Potteries for the lettER set. It shows how unknown the Potteries' dialect is that not even the great John Wells knows this. @ Ed: Is that not also common in Merseyside? Maybe it's a feature of northwestern England. @ yuriive: No, it's not a feature of north-western England. The Potteries is very much the Midlands, although its dialect does have some things in common with Scouse. I think that Scouse can use [e] or [ɛ] in lettER. These dialects can use [e] in KIT as well, whereas DRESS would always be [ɛ]. They both affricate /t/ as well. If anyone's looking for a good PhD topic, I suggest this one. The point of all of the above is that the translation or even transliteration of exotic terms is pretty debatable, even arbitrary, as the donnish and inaccurate caraoce for carioci ("karaoke") demonstrates. Why it's cafftan but kalmia, Kafkaésg (yuk) but Calahari, who can say? Is the dictionary right to "translate" this term with some possibly fanciful coinage that has probably never been used in anger, or should it just transliterate ("cabeliow"?) what was never really an English word in the first place? 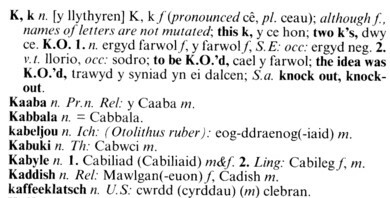 It also calls into question the status of those letters K, Q, V, X and Z supposedly non-existent in Welsh, to which some still persist in adding J in the teeth of its obvious existence. There are plenty of Welsh words containing Z, just read the Old Testament in Welsh. Kafkaésg seems frankly peverse -- why re-spell only the second half of a clearly foreign word? Not surprisingly, Google finds it only on this very blog posting. True "inkhorn words". John wrote: "Although Christy deplores the fact, it is very clear that loans in modern Welsh regularly come via English"
Talking of Welsh borrowings via English, I see from a web search that the Welsh language forum maes-e has three mentions of "corgis" to just one of "corgwn". Scarcely a big sample, but even so, for apparent native speakers to apply an English plural to a word of Welsh origin takes some doing. I won't quote the examples though, as some may find the comments offensive. You're right, of course. So what are people thinking of, spelling it like that? Google: Spaghetti Bolognese 1,840,000 hits, Spaghetti Bolognaise 458,000. John of course gets it right in LPD, with the entry bolognaise, bolognese in that order, ˌbɒl ə ˈneɪz, and even -ˈnez for the UK, and ˌboʊl ən ˈjeɪz for the terribly correct US, and Italianate efforts nowhere. Actually, bolonaise would be the correct French spelling. Where did you get that from? It's not for Bologna or à la bolognaise. Are you thinking of boulonnaise? I was not aware that les spaghettis came in an à la boulonnaise version! I got it from my Grand Larousse encyclopédique, and have now confirmed it with an on-line French dictionary. The link in my last post may not work. In which case, try http://www.cnrtl.fr/definition/bolonais. Thank you, Steve. I had already found that. I must make a note of your method of defeating "Session expirée"! But even that doesn't claim bolonais can be used for the spaghetti dish. I have had a good root around and as far as I can see the two dictionaries you mention seem to be the only ones that recognize it as being used of Bologna in any capacity. All the others only recognize bolognais in either sense. Perhaps they've all gone PC. What's that vogue expression for foreignistic spellings and pronunciations? It looks a bit as if the "terribly correct US" ˌboʊl ən ˈjeɪz that I cited is no more terribly correct than it ought to be, and the UK ˌbɒl ə ˈneɪz, and -ˈnez may not be anti-foreignistic, but proto-foreignistic, dating from before your 'bolonaise' was superseded by 'bolognaise'. Spaghetti(s) (à la) bolo(g)naise/à la bolognese (forme ital.). Spaghettis accompagnés d'une sauce épaisse à base de légumes (céleri, oignons, tomates) et de viande de bœuf hachée. Vous avez demandé pour votre déjeuner, rue de Richelieu, dans un restaurant (...), des spaghetti à la bolognese, mais ce qu'on vous a apporté méritait-il vraiment ce nom, ou bien était-ce la solitude dans laquelle vous vous êtes senti soudain en les mangeant qui vous a empêché de les goûter, de les apprécier selon leurs mérites véritables? (Butor, Modif., 1957, p. 60).